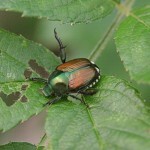 Have Japanese Beetles Attacked Your Yard? Watch out for Signs of Japanese Beetles! Are patches of dead grass spotting your yard? Have the leaves of your plants, trees, and bushes been eaten seemingly overnight? If so the most likely culprit is the japanese beetle. It takes seven years for japanese beetles to progress from an egg into adulthood. So, if you've never seen them in your yard before and now your plants are crawling with them, all those eggs that were laid seven years ago are now hatching. Japanese beetles are so vicious that can eat through a rose bush in less a day, while their grubs feed on the grass roots leaving dead spots in your yard. We've been seeing an enormous amount of these hungry pests lately. So call us quickly at 262-521-1258 or click here for a quote before your plants disappear!